Macroscopically, the liver of birds consists of two lobes, a left lobe (lobus sinister) and a right lobe (lobus dexter), both of which get drained by its own branch of the v. portae. It is not so well defined in smaller lobules (lobuli) as is the case in mammals (especially pigs). 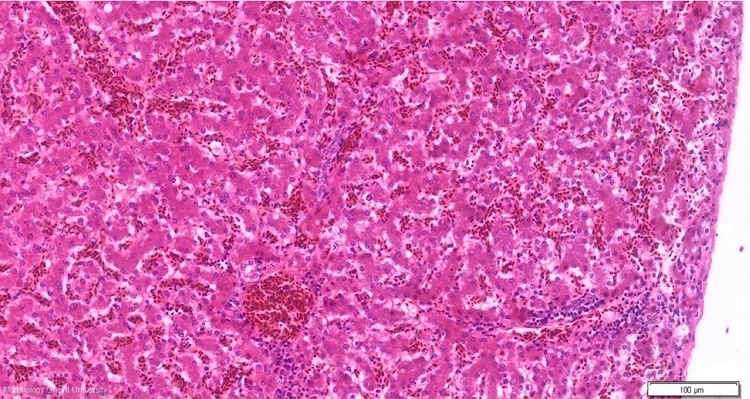 A histological section thus shows a homogeneous mass of parenchyma with intralobular veins and interlobular vessels irregularly distributed. The surface of the liver is covered by a peritoneal layer of mesothelium and a very thin Glisson's capsule.